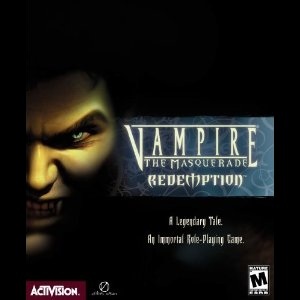 Vampire: The Masquerade - Redemption is a great-looking action-packed role-playing game based on the White Wolf pen-and-paper RPG. It's got a great premise and an ambitious design, but the game is mired by its repetitive and often frustrating combat, ill-fated design decisions, and forgettable characters and story. The graphics in Vampire are unmatched by those in any other computer role-playing game. You play the game from a third-person perspective, which is zoomed in fairly close and raised slightly above your main character. Up to three other characters will join you and follow as you travel around on foot across medieval Europe and beyond, and you can choose to directly control a different member of your party at any time. Vampire's fully 3D environments look remarkably realistic because of their stunning detail and moody, subtle lighting effects, which remain consistently impressive through all the game's many varied and interesting settings. 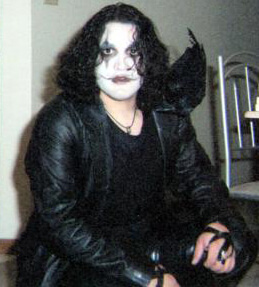 As crusader-turned-vampire Christof, you'll travel through Prague and Venice and into fearsome catacombs or thereabouts. Later in the game, you'll find yourself in modern-day London and New York. All these cities, as well as all the outlying corridors and hallways you'll explore, are uniquely rendered to an extraordinary level of quality. Although you'll sometimes travel through such typical settings as abandoned mines and sewers over the course of Vampire, even these overused set pieces look good in the game. Some of the best of Vampire's environs include a hollowed-out, magical tree that's home to an ancient vampire clan; the decadent, gilded mansion of a vicious vampire lord; and the rain-soaked, neon-lit streets of London. The characters in Vampire look equally good. They're stylized to move with an exaggerated gait, and can brandish a wide variety of great-looking deadly weapons, which they'll use in the game's frequent combat sequences. Switching weapons and armor will affect your character's appearance, and even his 3D animated portrait at the bottom of the screen. Yet although Vampire's characters are lavishly detailed compared with those in virtually any other computer game to date, you'll still find that they could have looked a little better. Specifically, some of the texture mapping on the characters looks too flat, particularly Christof's own flowing cape - otherwise, the vampires' animated faces are offset by their perfectly still posture during the game's dialogue sequences. The in-game cinematics lack any sort of dramatic tension, as your characters will merely stand still and deliver their lines - and often poorly, on account of the game's almost uniformly bad voice acting. If any action occurs during the cinematics, it's marred by stilted animation and bad camerawork. As such, it's surprisingly disappointing how weak a lot of Vampire's presentation is, in light of the overall quality of the game's appearance. The weak cinematics and voice acting might begin to explain why the game has comparatively little dialogue overall, and why it has almost no character interaction whatsoever. You'll occasionally be faced with choosing from two different options during the dialogue, but in hindsight - or in replaying to test the other alternative - you'll realize that most of these decisions are trivial. Though the game's script uses a lot of fancy language and generally reads well, you'll likely find yourself growing weary of the game's typically static, drawn-out monologues. Thus, you'll find that you'll meet very few interesting characters through the course of the game. Even Christof himself fails to develop into a strong protagonist, despite the fact that he's got a perfectly good dilemma to work with as he struggles with his vampiric existence in the wake of his devout religious upbringing. But by much later in the game, Christof merely comes across as having grown used to being a vampire rather than discovering anything about himself, which is disappointing. Therefore, just as Vampire's dialogue sequences are largely clumsy and forgettable, its plot is basically boring. And that's a shame - especially considering the scope of the game's source material, which along with the fact that the game is entirely linear, should have allowed for a more interesting story. But because there isn't much of a story in Vampire anyway, what ought to have saved the game was its near-constant action sequences - but unfortunately, they're every bit as weak as the plot. Vampire's real-time combat is simplistic and often chaotic. The game's point-and-click interface requires you to merely keep clicking on your target until it dies. If you have one to three other members in your party, they'll join the fray and attack with you. Unfortunately, since the game's characters take up so much space onscreen, your companions will have a bad habit of stepping right in front of your mouse cursor, causing you to halt your attack against your intended target. Similarly, you'll have to navigate through fairly narrow corridors a great percentage of the game, and in such cases your party members will have a lot of trouble getting past you to face your enemies. In later portions of Vampire when your group is armed with guns and such, you'll witness your companions wasting plenty of ammunition while foolishly trying to shoot their enemies through walls - and the guns themselves are awkward, underpowered, and slow. The game's transition from the Dark Ages into contemporary times is certainly its best moment, but you'll find that a lot of the modern-day gadgets and weapons aren't as well designed as they could've been.